If I was to run away undetected, I would have to use the escape ladder. And run away I must. You see, I was fifteen, and my parents were insufferable. The ladder was a jangle of chains and bars that hooked onto the windowsill. Luckily our house had never burst into flames, so it was in perfect condition, having sat in its original box in our bathroom cupboard since the 70’s. Or at least that’s when the people pictured on the box looked like they were from, with their feathered hair and polyester nighties. They showed perfect confidence in the ladder as they descended from a flaming window wearing dainty bedroom slippers. This was going to be great. Nothing to fear. Nope, not a thing. Quietly I slid open the bedroom window and lowered the ladder down the side of the house. Uh-oh, it didn’t reach the bottom. I was going to have to drop from the lowest bar to the ground, about six feet. And shouldn’t someone be at the top to make sure it didn’t come unhooked from the sill? I didn’t want to die before running away—how anticlimactic. I’d never done anything this bad or risky before, so I wanted to make sure I did it as safely and perfectly as possible. I needed to get an 'A' in running away to avoid screwing up my GPA. As dusk swept in, the moonlight shown on each rung, highlighting my path. Once more I went through the contents of my backpack to make sure I had everything a good runaway would need. Thermal underwear, check. Floss, check. Several denominations of cash and change, check. Healthy but tasty snacks, check. Library Card, check. This was it. I stood on my bed, carefully turned myself around in the window, channeled my inner Kerouac, and began the descent. The ladder was swinging side to side under my movement, sending rattling clangs across the neighborhood. (Originally, I planned to exit the window just as the the 9 PM curfew siren sounded from the fire department. But, as it turned out, I couldn't synchronize my wristwatch with the curfew clock because I hate setting watches. In fact, it was still an hour off from daylight savings. So somewhere around 8 PM I finally left—I know this because MacGyver's theme song was muffling up through the floorboards from the living room.) I was eager to feel earth beneath my Vans, so I started taking the rungs two at a time. Then the dangle and the drop. Whew, no broken ankles, and no sound of my parents’ arching eyebrows or widening eyes from the living room. I was OUT. I escaped! Check ya later, tyrants! Peace out “society” and your stupid rules! Have fun in your boxes, Squares! Hmmm … Where should I go? What should I do? I can do anything I want! The strategizing commenced: I’ve got to get away from the neighborhood—that’s the first place the cops will look when my parents find me missing and call 9-1-1 all frantic, hugging each other, repenting for how they’ve treated me, begging the community to partner with them in returning me to safety. And I have to take a route accessible only by foot so I won’t be lit up in anyone’s headlights. But the woods are scary at night. Maybe I’ll take side streets. But the side streets are confusing without a map. I guess I’ll have to take the main road, but I'll take it nonchalantly so as not to arouse suspicion. It was dark now. I was scared. I started to run. I decided to run to King’s. It was a 24-hour family diner in the middle of town, the only 24-hour outfit going besides the new pump-it-your-own-damn-self gas station. True, it wasn’t the caboose of a freight train, like Kerouac would have chosen, but he wasn’t female, and he wasn’t an honor student. About an hour later I spotted the restaurant flickering in the valley of a busy intersection. From the crest of the hill, I romanticized my journey, imagined the drunken handshakes the Beats were giving me, and felt the cool air on my sweaty face. I had run almost the whole way in an oversized wool sweater with a five-pound backpack bouncing up and down. I was going to order a great big milkshake. Approaching King’s, I realized that I needed to escape the workers’ notice because the cops were sure to check for me there. Crap, that meant no milkshake. Instead, with head down, I walked to the restroom, locked myself in the handicapped stall, sat on the toilet tank so no one would see my feet if they looked under the door, and took out some of those orange cracker sandwiches with peanut butter filling. Then I took out my journal to begin a rhymeless poem chronicling my freshly seized freedom. After about an hour, I was bored and experiencing writer’s block because some lady had been struggling for ten eternities in the stall next to me, destroying my creative focus. I risked a lot by exiting the bathroom to peek around the corner into the diner’s smoking section, looking for whoknowswhat. And there was my brother and his girlfriend, home from college for Christmas Break, sharing an ashtray and fried zucchini appetizer. They were part of the search party, no doubt. I ran back into the bathroom. Eventually they left. And I still didn’t have a milkshake. Around 11 PM I decided to use the lobby’s pay phone to call the exponentially cool Senior I had a crush on. He drove. Maybe he could drive me to a modest-but-clean motel that wouldn’t question my age. And if not, maybe he would confirm my edgy-ness for hitting the road, striking out alone, kissing conformity goodbye. I must have dropped 20 quarters down the slot over the course of two hours. His phone just rang and rang and rang. And then he answered. He sounded tired or drunk, maybe both. Excitedly I relayed my escape and current location. “I never thought you’d be so stupid,” was his reply. “Well, if my parents call you, don’t tell them where I am, OK?” I quickly said, embarrassed. “No, I will tell them. Go home. I have to go.” And he hung up. That was the loudest dial tone I’ve ever heard. By now it was 2 AM. I was tired, hungry, and romantically thwarted. What was there left to live for? I was at the end of my chain-link ladder. Jack couldn’t expect me to continue on in this manner. 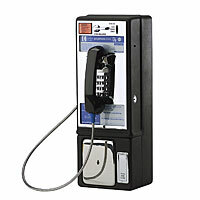 So I picked up the payphone one last time. “Can you put Johnny on?” I asked. “I’m at King’s,” I told him. Fifteen minutes later my brother pulled into the vacant parking lot, and before he could put Dad's Buick in park, I climbed into the back seat. I was ready, not for a night on the cold, hard earth under the piercing stars, but for a deep sleep under my rosebud comforter. I was imagining the reheated beef stew that would induce the slumber. And the reassurance of a purring cat at the foot of my bed. There was no teary-eyed reunion as I re-entered the house. There were no cops radioing the Chief that I was found alive. I did not apologize for causing them worry, and they did not apologize for being annoying. They were glad I was OK and warned me that the ladder was for emergency use only. I was disappointed that I didn’t scare them or teach them a lesson. And that they didn’t offer me reparations in the form of a milkshake.